In his new role with the Grand Rapids investment and wealth-management services provider, Blower will provide sophisticated financial planning solutions, retirement income strategies, estate planning, investment portfolio management and related services for individuals and through employer-sponsored programs. He will also be responsible for the developing a comprehensive retirement planning process to be utilized across the Legacy Trust platform. Most recently, Blower served as director of financial planning for Wealth Dimensions Group in Blue Ash, Ohio, where he was responsible for the development, maintenance and execution of the firm’s financial planning offering. 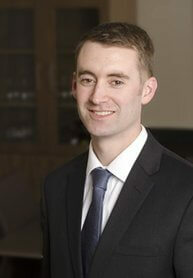 Previously, he has worked as a financial planner for Lincoln Financial Advisors and Mass Mutual Financial Group. Blower is experienced in retirement planning, investment planning, income tax planning and budget/cash flow analysis and in working alongside clients’ other trusted advisors, including attorneys and accountants. Blower received his bachelor’s degree from Miami University in Oxford, Ohio. A native of Athens, Ohio, Blower now resides in East Grand Rapids with his wife, Jenny, and their children Owen and Natalie.